speak on April 24, 2005, at the Japanese American National Museum in Los Angeles. Appearing in Life magazine’s coverage of Malcolm X’s assassination is a photo of an Asian woman holding the head of the slain human rights leader. In that March 5, 1965, issue, there is no mention of the woman’s race and she is not named. This is symbolic of distortions in history. Asian American activism is rendered nameless and invisible. Black nationalism is misrepresented as separatist. After Yuri Kochiyama passed away on June 1, 2014, Life magazine republished that same photo, now naming her in the headline. But now I fear another distortion, of Yuri being remembered for two moments frozen in time: this photo and her time in the concentration camps. These were important influences in Yuri’s life, but the wartime incarceration and Malcolm X each have complex histories. And Yuri’s life and activism extend well beyond this narrow framing. The work of researching and writing Yuri’s biography, Heartbeat of Struggle, changed me in ways I hadn’t imagined. Beginning with our first interview in December 1995, I got an entrée into the political world encircling Yuri in Harlem. When I first entered her four-bedroom housing project apartment, I encountered walls completely covered with political posters of Malcolm X, Mumia Abu-Jamal, and numerous political prisoners; flyers announcing the latest activist events; and shrines to her children Billy and Aichi and her husband, Bill, as well as to those who had passed in her life. The kitchen table was covered with the work of writing to political prisoners; responding to the many requests for information, archival documents, or interviews; maintaining her color-coded address book; and with numerous newspapers and books. I later discovered that that table was a major source of tension. Her family struggled to find a place to sit and eat, while Yuri insistently worked there, making her artistically styled picket signs, writing for movement publications, and corresponding with political prisoners through the wee hours of the night. Her home was alive with the buzz of visitors, phone calls, and a sense of urgency to get out the latest on the campaigns to free Mumia, David Wong, Yu Kikumura, Mutulu Shakur, and Puerto Rican political prisoners. As I stayed with Yuri during multiple week-long interview sessions, hosted her in my home, and accompanied her to events during what would become a 20-year friendship, I got to meet many of her political associates, and to go on several visits to see Marilyn Buck imprisoned at Dublin, California. I remember accompanying her from New York to Washington, D.C., in 1998 for the historic Jericho March and rally to defend political prisoners. There I met Muhammad Ahmad (formerly Max Stanford), who was a major leader in the Revolutionary Action Movement, who had worked with Malcolm X, and whose intellectual and political prowess inspired Yuri—who in turn pushed for a wider audience for his book, Toward Black Liberation. I remember Yuri being inundated with a near non-stop flow of old friends wanting to say hello and young people wanting to meet one of their activist heroes. Another time, Yuri and I went to attend an event on Puerto Rican political prisoners at Hostos Community College. We were already on the subway before I discovered that Yuri, a New Yorker of more than 35 years, was expecting me, a Californian, to navigate our trip. Somehow we made it, and I got to hear the most inspiring stories by Jose Lopez about his brother, Oscar Lopez Rivera, behind bars since 1983 for his struggles for Puerto Rican independence. Yuri was particularly thrilled to get to see the children of Carmen Valentin and Dylcia Pagan, women incarcerated since 1980. If Yuri were alive she’d urge you to watch the powerful documentary The Double Life of Ernesto Gomez Gomez, on the reunion of Dylcia and her son, sent into exile when Dylcia and her husband went underground to join the clandestine wing of the Puerto Rican struggle. Yuri was widely known for her generosity and her humility. She and Bill opened their home to strangers who had no place to stay, for social gatherings every Friday and Saturday night, and for a multitude of political meetings. Yuri was attentive and nurturing. While young people wanted hear to Yuri’s stories, she was more interested in learning about their lives and astounded me by remembering details years later. The representations surrounding Yuri in death of that photo with Malcolm and of her wartime incarceration signal her social justice work. But they miss the greater meaning of her activism, her interpersonal practices, and ultimately, the ways she saw the promotion of human dignity as inextricably linked to the struggles for decolonization. Yuri’s critiques of imperialism in the US, Africa, Asia, the Middle East, the Caribbean, and Latin America, and her six decades of radical activism deserve deeper study so that we can locate Yuri in her rightful place in history. Diane C. Fujino is professor of Asian American studies and director of the Center for Black Studies Research at the University of California, Santa Barbara. She studies Asian American radicalism and Afro-Asian solidarities, and is the author of Heartbeat of Struggle: The Revolutionary Life of Yuri Kochiyama and Samurai among Panthers: Richard Aoki on Race, Resistance, and a Paradoxical Life and editor of Wicked Theory, Naked Practice: A Fred Ho Reader. 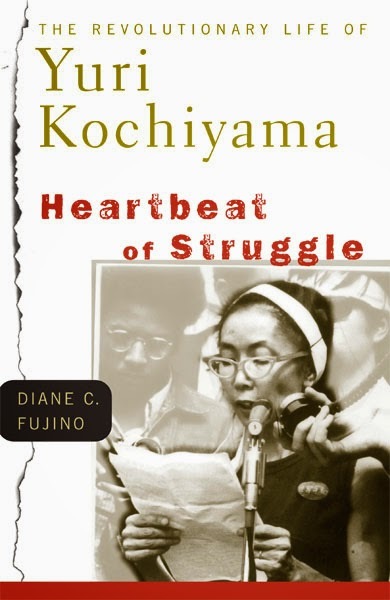 Inspired by Yuri Kochiyama, she is a longtime activist in political prisoner, anti-war, public education, and Asian American movements.